The old scar that once dissected Beirut in half – the infamous “Green Line” – is slowly being rebuilt with cultural spaces. At the same intersection as the National Museum of Beirut, next door to the MiM mineral museum and not far from Beit Beirut, the Association for the Promotion and Exhibition of Arts in Lebanon (APEAL) is getting ready to offer the country a new art museum and public space. Set to open in 2020, the Beirut Museum of Art (BeMA) aims to become a cultural hub for the city by offering a new platform for contemporary and modern art in the region, while also fostering reconciliation and facilitating dialogue and cultural exchange. The latest step in BeMA’s development has been to choose a design for the building, which will be located on Saint Joseph University property. After a competition that shortlisted 13 entries, French-Lebanese architect Hala Wardé and her company HW Architecture’s project was selected. The winning entry consists of a low space housing the main galleries, connected to a high tower. Curious to find out more about the future museum, Executive Life asked Wardé about the unique design and how it fits into the community. E The design of the building includes a main section of galleries that is partially sunken and covered by a roof garden, connected to a 124-meter tower. Why did you choose to design a building that stands out so much in the city? The museum program is housed in a low rise building of mineral bedrock, which develops around a well and a sunken garden. The Campanile [tower]is an essential vertical counterpoint that, through its presence, marks the cultural territory of the site. It becomes a landmark in the city, an urban and territorial signifier, a meeting and gathering point. In a way, it is the “other” lighthouse for Beirut, a terrestrial lighthouse in complementarity to the coastal one. E How will the interior space be divided? And how does the design of the building complement the art that will be on view inside the museum? 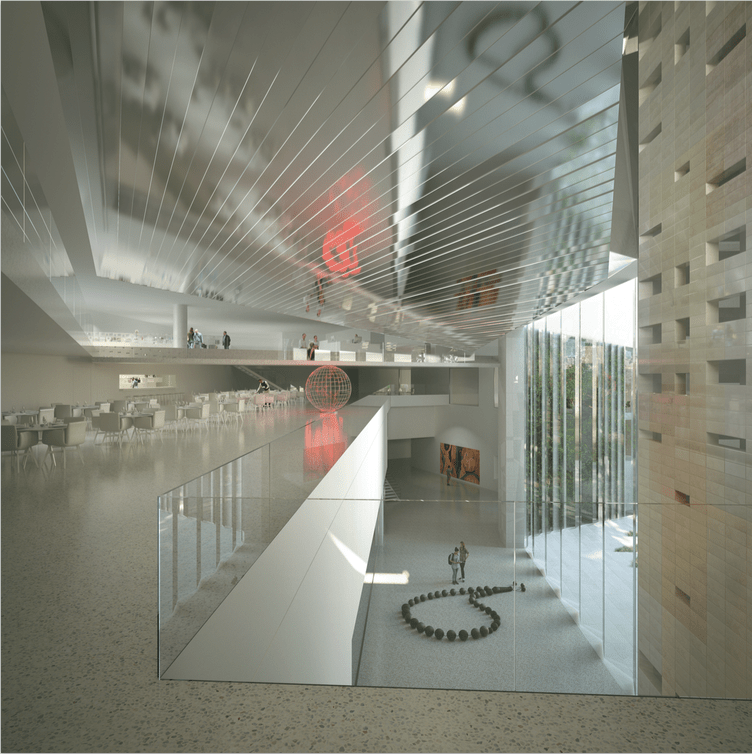 We enter the museum through a grand lobby that develops over several levels, linking Damascus Road to the museum gardens below. The permanent exhibition space is situated above the lobby, and the temporary exhibition space below, on the garden level. Next to this, there is a performing arts space which will offer an important program complementing the exhibitions and which we propose to extend to the outside space with an amphitheater. The visitor can experience the different spaces via a ramp situated in the lower part of the Campanile that ties all the public spaces of the museum together, including the terrace and the garden. E How does the design aid the idea of the museum being an inclusive space that is inviting to the community? I was very keen to anchor this project into the city and its urban tissue, in relation to the existing cultural institutions around it, and make it a place that strongly belongs to Beirut’s identity; a place that is artistic, cultural and social at the same time. The garden that develops around the well is a strong component in this regard. It is inscribed into the continuity of the green band that begins with Horsh Beirut [down the street]and continues through the USJ campus. It adds a very important value to this site and its surroundings. It transforms the site into a territory of art, with the presence of water that will trace the route of the visitor from the mineral rock promenade on the terrace on Damascus Road to the lush vegetation below. 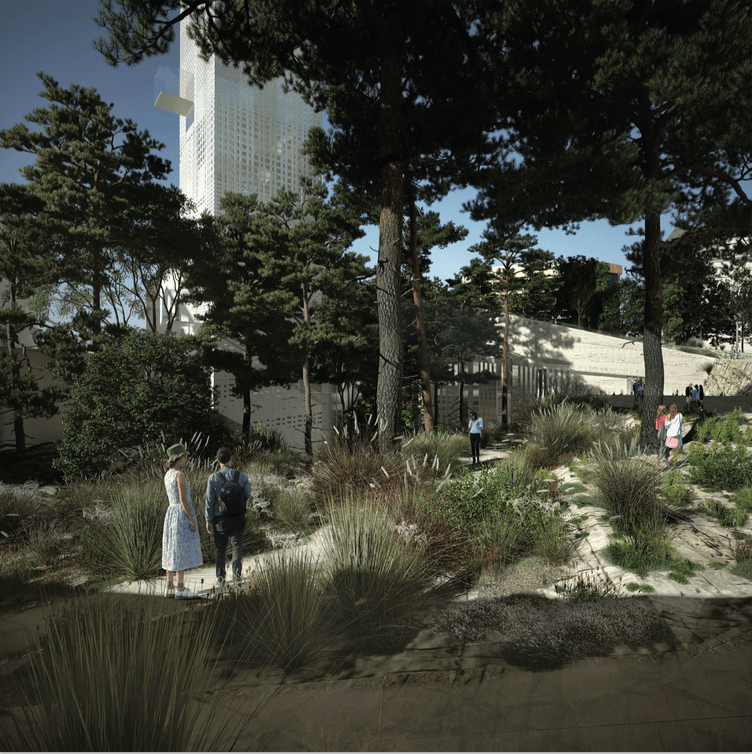 This garden will become a meeting place, a place where people can spend time, visit the exhibitions and experience the artistic interventions that will take place in the Campanile. E What are some elements of the design that particularly stand out? After the garden, and in complement with the mineral bedrock, the Campanile is certainly the element that will stand out as an architectural expression of art. Beyond its various possibilities of use, it will become, through its multiple expressions, a tower of wind and water, a tower of light, a tower of knowledge, a tower of memory and a tower of music, by virtue of its façade, which is made like a musical score with enameled bricks taking on the changing reflections of the light and sky.